Choose a time slot and click "Book It" to reserve your boat. 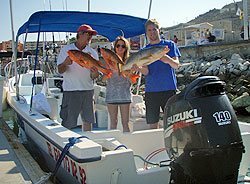 You will receive a confirmation via e-mail within 24 Hours (in most cases) containing all the information you'll need to find your charter as well as other relevant information. Our trips are all private charters. The total price is for the whole boat to yourselves, not per person, and you will not share the boat with anyone you don't bring with you except the crew. MAKE A SELECTION, THEN CLICK "BOOK IT"
Please write the names and ages of all passengers in the special instructions box when booking. Price is up to 14 People. The remainder is paid in cash on the day of the trip. 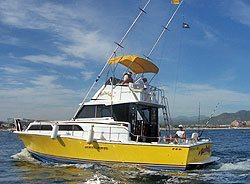 Payment: All reservations except our 72' Yacht and Fly Fishing trips require a 50% deposit to be placed by major credit card at the time of booking. The remaining balance will be shown on your confirmation and is due in cash at the marina. 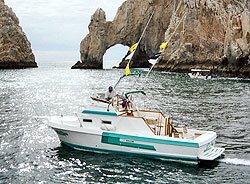 We cannot accept credit cards at the marina, only cash, but ATMs and banks are widely available in Cabo San Lucas and of course you can bring USD with you from your home country as well. Cruise Passengers - Our trips are open to cruise passengers. Typically a 5-hour trip works best. You can choose your start time to fit your ship's schedule, and our boats are stationed at the same marina where your ship will make port so you can walk or take a water taxi if you prefer. These are private charters, so we can come back early if you need to in order to make your ship. 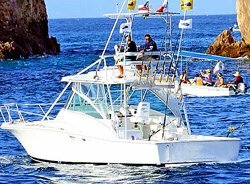 Bait - About 80% of the deep sea fishing in Cabo is done using lures, with calamari mostly used for bottom fishing trips and ballyhoo is also sometimes used for trolling. Live bait is not typically used, but is available for purchase at the marina in packages of 5 that cost $15 each if you have a preference for live bait. Typically a package of 5 is suitable for a half-day while two packages is recommended for a full day trip. Food and Drinks - There are stores and restaurants available at the marina to buy food and drinks, but if you choose a very early start time, you'll want to have your hotel or ship pack you a box lunch or pick something up the night before just in case. We can also provide beer ($1.50 ea for Mexican beers or $2.00 each for imported beers), soft drinks or water ($1.00 ea) and a box lunch ($10.00 ea) upon request. Just write your request in the special instructions box when booking. You'll pay in cash upon arrival to the marina for these. 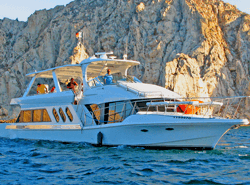 * Our 72' Bluewater Yacht includes a hot-cooked Mexican Lunch served onboard, and also an all-you-can-drink open bar. 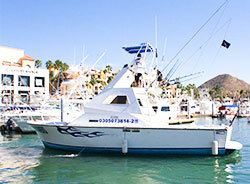 *Fishing License - The cost of a fishing license is 395 Mexican Pesos per day. That is approximately $20.00 USD, depending on the exchange rate that day. In order for us to secure your fishing license, we will need to know the names of each passenger, so please write that information in the special instructions box when booking. Everyone age 12 years old and up must have a fishing license to be on the boat, even if they have no plans on actually fishing. To facilitate securing your license, please write the names and ages of all guests in the special instructions box when booking. 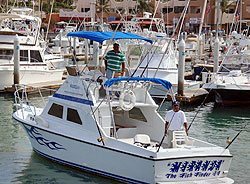 **Marine Sportfishing Logbook Tax - This is a $15.00 USD per boat government-mandated tax that must be paid in cash directly to the marina on the day of the tour. 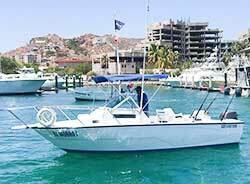 The tax is used to fund a program where the marina strives to record every fish caught in Cabo every day to track species and fish supplies and help ensure a sustainable fishing industry here in Cabo San Lucas. It is applicable to any boat 25 feet in length or larger. Your fee is good for up to 6 fishing trips during your stay, you don't have to pay it every time out. from the U.S. and Canada at 1-866-348-6286.